Hero Baby standard 1 is an infant formula for babies up to 6 months. 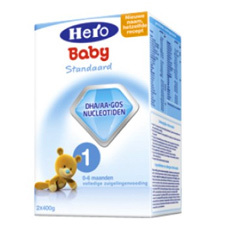 Hero Baby standard 1 is easy to digest and contains prebiotic fibres, nucleotides and important fatty acids DHA/AA, all nutrients that you also naturally found in breast milk. Each box contains 2 Hero Baby standard 1 foil packaging à 400 grams. To make 100 ml of infant formula to loose your 3 measuring spoons of 4.3 grams of powder in 90 ml of water. Are the unopened foil packaging approx. 2 year shelf life, after opening you need to use the contents within 4 weeks. 1 mix Hero Baby standard 1 infant formula is sufficient for 26 bottles of 200 ml. Of course do you want to give your baby the best infant formula that exists. That is why Hero Baby standard 1 such a good choice because it is a complete and easily digestible formulae which prebiotic fibres, nucleotides and contains important fatty acids DHA/AA. Hero Baby standard 1 infant formula is designed for babies from 0-6 months. Once your baby is 4 months old you can also Default next to him or her Hero Baby 1 always give other diet go, this first consultation with your doctor or dispensary. In the first months is breast feeding the best food for your baby. If you don't want to give then more can breastfeeding or infant formula the best alternative. From 6 months old can be replaced by Hero Baby Hero Baby standard 1 standard 2.